Authorities said a home surveillance camera captured Misty Wilke running over her boyfriend after she learned he was HIV positive. PHOENIX -- A woman ran her boyfriend over with a car after she learned he was HIV positive, according to police in Phoenix. 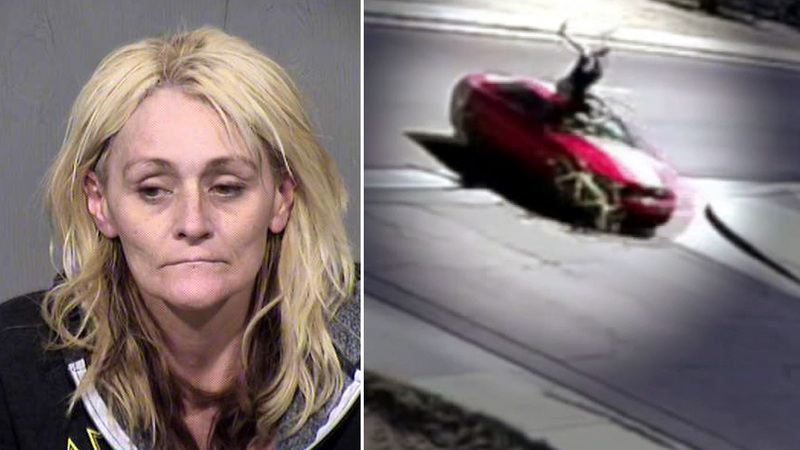 Newly released video from a home surveillance camera showed the woman, who police identified as 44-year-old Misty Wilke, running over the man on April 29. Authorities stated Wilke was furious after learning her boyfriend had tested positive for HIV. In the video, Wilke's boyfriend can be seen on a bicycle. Witnesses told detectives Wilke drove circles around her boyfriend in her Ford Mustang, appearing to try to hit him or intimidate him. Police said Wilke then lined up her car and floored the pedal. The vehicle hit the boyfriend head-on, sending the man flipping into the air. The man landed hard onto the pavement, suffering a broken back and head injury, according to court documents. Police said Wilke called them about a half hour later and reported that her boyfriend had pulled a knife on her and slashed her arm. Wilke told detectives she got in her Mustang, jumped a curb and drove through a park. Police stated said hair, blood and scalp were located on the car, including paint from the bicycle. Wilke was charged with two counts of aggravated assault and pleaded not guilty.